For many women, taking care of their fingernails is a significant part of taking care of their appearance. This is why, when fingernails break, it can be such a frustrating experience. As annoying as this condition is, knowing the causes of splitting and peeling nails and other triggers can show how to keep fingernails from splitting. Peeling and splitting nails are one of the four most common types of nail problems - the others are weak and brittle nails, cracked nails, and ridged nails. 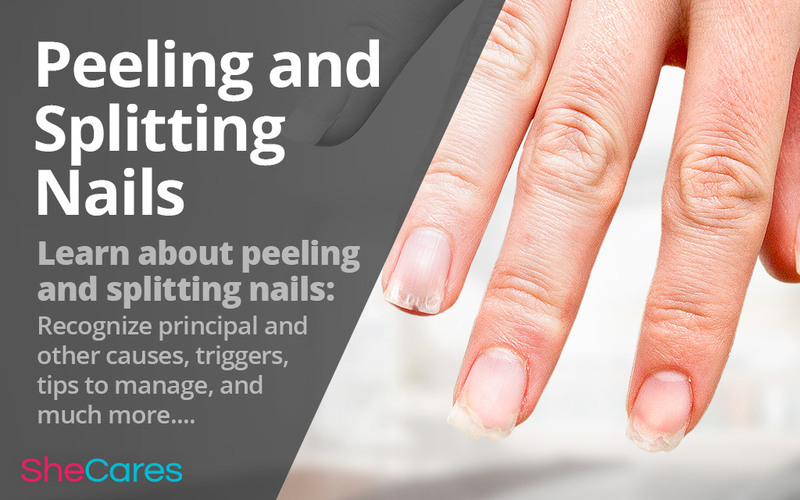 Splitting and peeling nails occur when the nail begins to separate at the edge, allowing layers of the nail to peel back at different times, giving the nail an uneven and ragged appearance. It may also look like the nail is flaking off. This makes it easier for edges of the nail to crumble or chip off, leaving the nail even more damaged. Decreases in estrogen levels affect many processes in women's bodies, and nail health is one of them. Lower levels of estrogen are connected to more problems with nails, including splitting and peeling. Certain conditions or other problems may make fingernails more likely to begin peeling and splitting. One common issue that often causes problems with fingernails is a nutrient deficiency. When the body receives too little of nutrients like protein, calcium, biotin, vitamin E, and a few others, it can have trouble building strong nails. Other possible problems are nail infections, which can have noticeable effects on nail growth. These infections may be caused by a fungus like yeast or by certain bacteria. While underlying causes may predispose nails towards developing a problem, there are other factors that play a role as well - triggers. While underlying causes may predispose nails to have problems, sometimes the triggers alone are enough to cause an issue with peeling nails. Often, splitting or peeling nails can be caused or exacerbated by using nails as tools. Any sort of difficult task performed with fingernails can cause structural damage to the nail that lasts for much longer than many people think. Especially damaging is using the fingernails in a prying motion, such as to remove nails from a surface or to open especially stubborn containers. This weakens the fingernails and can actually affect the nailbed - where the nail begins growing - which damages the overall nail structure. Even small things like texting and typing may cause nails to split and peel. When nails tap against screens or keyboards, it causes very small, gradual damage. Over time, this can build up and become a problem, such that it becomes obviously visible that the nails are being damaged. Because texting and typing are so common for so many people in this technological era, it is easy to inadvertently cause damage due to these triggers. Lack of fluids is another trigger that few people recognize as a problem for nails. Consuming too little water can have widespread effects on the body, and nails are one of the parts that suffer the most visibly. Without enough water, fingernails cannot be grown correctly, so they will become weaker and more prone to splitting. Since physical damage is one of the most common reasons behind peeling and splitting nails, it is important to protect the nails from overuse. Use tools. It is best to find and use tools in place of using fingernails when faced with a task that requires some physical force or effort to accomplish, even if it seems minor. Something as insignificant as peeling an extra adhesive sticker off of a surface can cause nail damage, so it is best to always use the proper tool. Trim nails. To minimize damage caused by typing, it may be best to trim nails to keep them short enough that they will not constantly hit the keys of the keyboard. However, many women prefer to keep nails long. In this case, it is possible just to work on staying conscious of the nails and making an effort to prevent the nails from hitting the screen or keyboard as much as possible. Drink more water. While it may take a long time before the effects of staying hydrated can actually be seen in improved nail growth, hydration will immediately assist the body in beginning new, healthy nails. This means that the new nails growing in will be stronger and less susceptible to peeling. Managing these symptoms can be easily accomplished after figuring out the triggers that cause the problem. Read more about brittle nails to familiarize yourself with common nail problems among women.